Unsworths Funeral Directors can be found on Cooper Street in Bury town centre; right next to the Castle Armoury and a short walk from Mill Gate Shopping Centre. 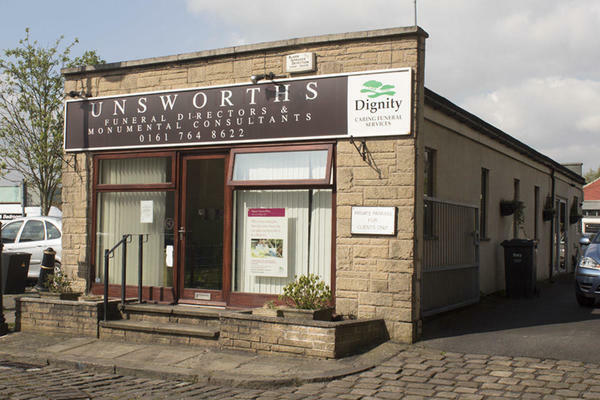 For many years, we have been aiding the communities of Elton, Fernhill, Woolfold, Walshaw and Tottington, where we have another Unsworths Funeral Directors. With our knowledge and expertise, we will provide you with a bespoke and fitting funeral to celebrate your loved one's life. We can offer different types of funerals, whatever your preference; we listen to you to your every requirement. We are here to serve, guide and assist you, which means you can depend on us to give an unparalleled standard of funeral care. What matters to you, matters to us, that is why everyone in our care are treated with the kindness and compassion they deserve. Our dedicated team are here for you, we are available 24 hours a day to support you throughout this difficult time. At Unsworths Funeral Directors, we understand how special life is with those that you love. For us, every funeral is unique and personal. We have a service to fulfil every wish, with every detail carried out with the same uncompromising quality of care. From a traditional service, to a colourful woodland burial, your options are limitless with our Full Service Funeral. If you have a little more flexibility when it comes to arrangements, then we can provide a Simple Funeral for a lower cost. We are situated on Cooper St Bury next to the Castle Armoury. Our staff are available 24 hours a day on 0161 764 8622 if you require our services outside of these hours.